Movie sequels can be tricky things. Sometimes, movie number two is better than the original, but sequels can threaten to undermine the self-contained perfection of the first film. That's ultimately why we never saw a sequel to E.T. 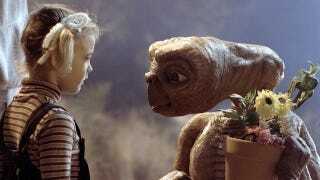 : The Extraterrestrial, although that doesn't mean Steven Spielberg never thought about it. His 1982 treatment for the E.T. sequel would have brought evil aliens into the mix. The evil creatures are carnivorous. Their leader, Korel, commands his crew to disperse into the forest to acquire food. As the squat aliens leave the gangplank, each one emits a hypnotic hum which has a paralyzing effect on the surrounding wildlife. These creatures are an albino fraction (mutation) of the same civilization E.T. belongs to. The two separate groups have been at war for decades!